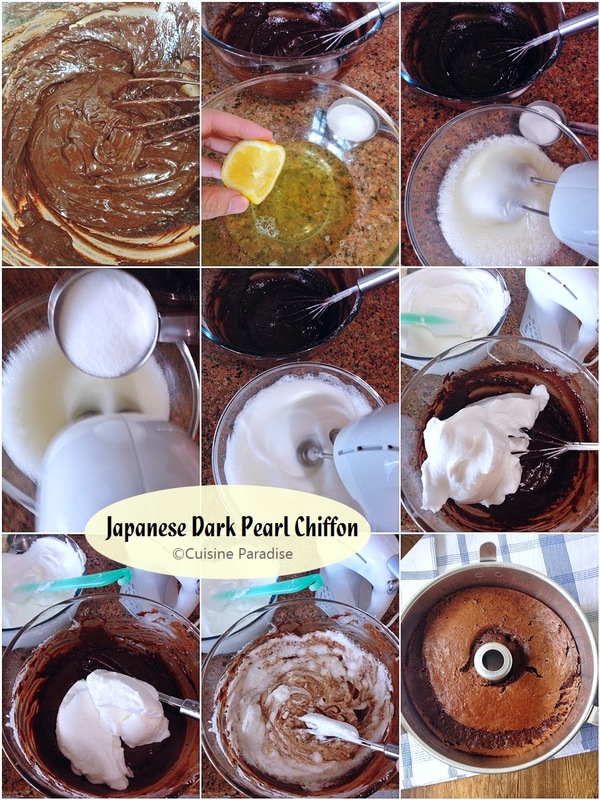 Being a chiffon cake lover, I am always excited to explore new flavour so when I saw Eileen's Japanese Dark Pearl Chiffon photo on my Facebook timeline. I immediately bookmarked the recipe because of its unique name plus the use of "dark chocolate" as one of the key ingredients. Just to share this recipe was initially from Aunty Yochana website many years ago and bakers who tried all shared good review on it even till now. This recipe is slightly different from the chocolate chiffon cake which I made previously because it had a richer taste and moist texture which similar to those Japanese Souffle Cheesecake. I sure like me you are also curious with the name of the cake and wonder how it could be related to "dark pearl - 黑珍珠" which is not even stated in the ingredients list. And from what I have Google about this cake, the conclusions seems to be because of the dark chocolate and cocoa powder used. 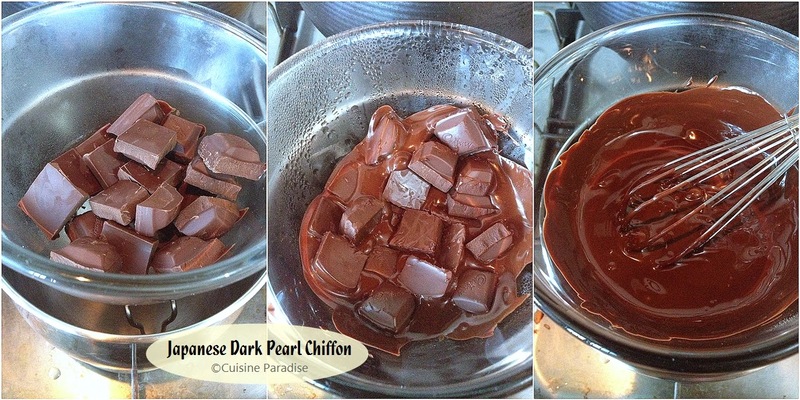 As these two ingredients gave the cake a darker brown which make it shine like the precious dark pearl. 1. Melt chocolate (break into small pieces) over a pot of simmering water. Set aside to cook. 2. Beat egg yolks till creamy, stir oil, milk and melt chocolate in order. 3. Next add in sieved flour mixtures (cake flour, cocoa powder, baking powder, soda & salt) and whisk till no trace of flour found. 4. Beat egg whites with lemon juice till frosty then slowly add in sugar and beat till stiff peaks. 5. 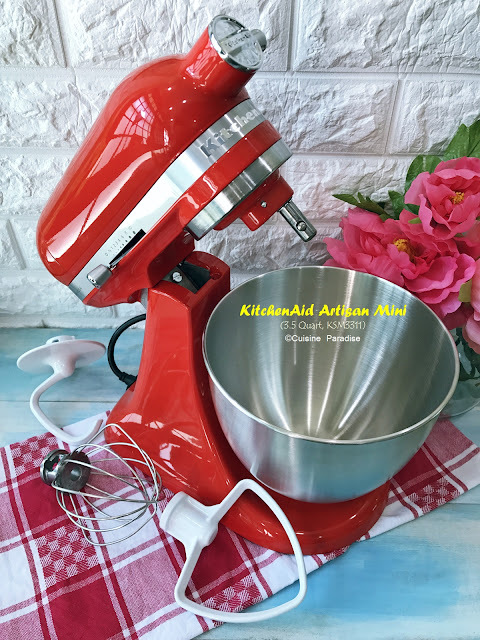 Using a balloon whisk gently fold in egg whites into the prepared yolks batter in 3 batches till no trace of whites and the mixture are well combined. 6. Lastly lift up the bowl to height, pour batter into the tube pan and tap the pan once or twice on a table top to get rid of any trapped air bubbles in the batter. 7. Bake cake in preheated 160°C degree Celsius (320°F) oven (2nd lower rack) for about 43 - 45minutes or when the surfaces turns golden brown (you can insert a skewer into the centre and test if it comes out clean). 8. Remove it from the oven and invert the pan immediately to let it rest on top of a cup. Make sure it cool completely before unmould. 9. To remove the cake from the pan, run a thin-bladed knife (i use a small plastic spatula) around the inside of the pan and the center core. 10. Release the cake and run the knife/spatula along the base of the pan to remove the cake completely. 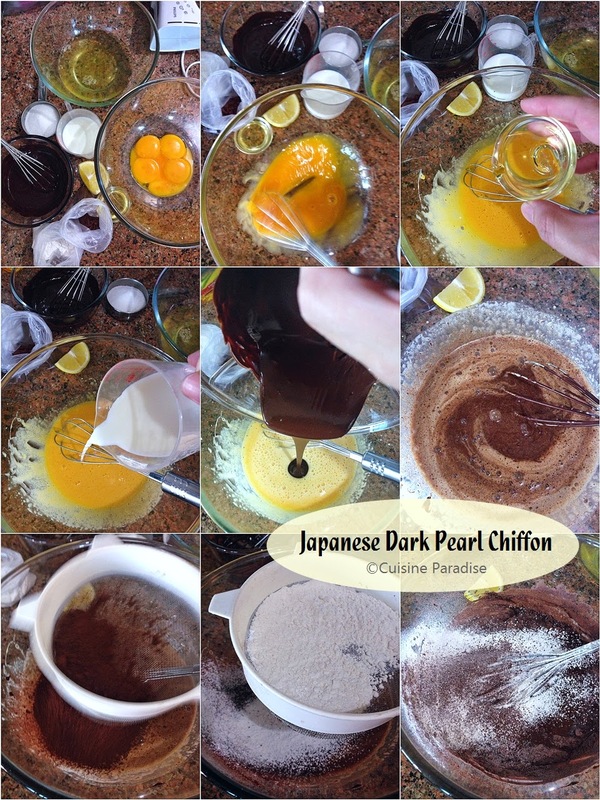 ~ The egg yolk batter with chocolate will be thicker than the usual chiffon cake yolk batter so don't worry about it. ~ Just to take note the final batter (after mixing in the stiff egg white) will be slightly runny when compared to the normal chiffon cake batter which is thick and fluffy. If you like dark chocolate and cotton light texture chiffon. 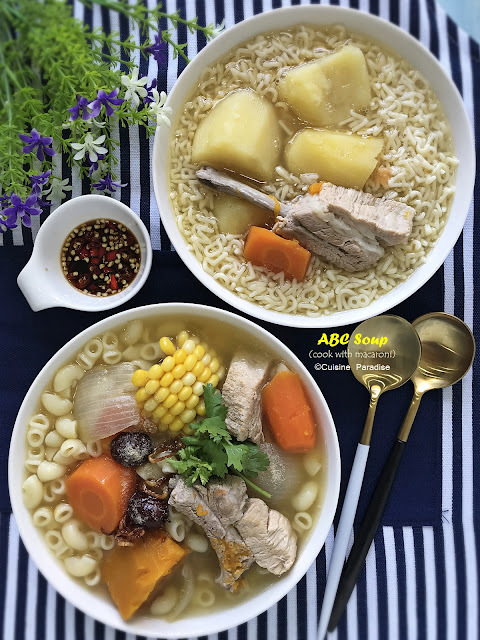 I would recommend you to try this recipe which I am sure you would love it. You can either have it on its own or pair with some whipped cream or a scoop of vanilla ice cream plus some fresh berries. Ellena, this looks really my type of cake. Am bookmarking it! Thank girl! Thank you for the recipe. May I check whether can I bake using an ordinary cake tin instead of chiffon cake tin. Ellena, I baked this before, very yummy! Hi Ellena, I baked this too and was kind of worried when I see the runny batter, but it turned out very nice:D Yours looks really pretty and neat! There is an error in Chinese recipe. The cocoa powder is 55g instead of 25g. And I followed it without notising. No wonder my egg mixture is so dry I ended up adding milk. Don't know how my cake will turn out.... sigh.... worried!